The other week I received something cool in the mail - a trophy from Triathlon QLD (TQ) saying I am the 'Triathlete of the Year' for 30-34 yr old males! Each season TQ has a number of races that give you an opportunity to win points towards winning this trophy. 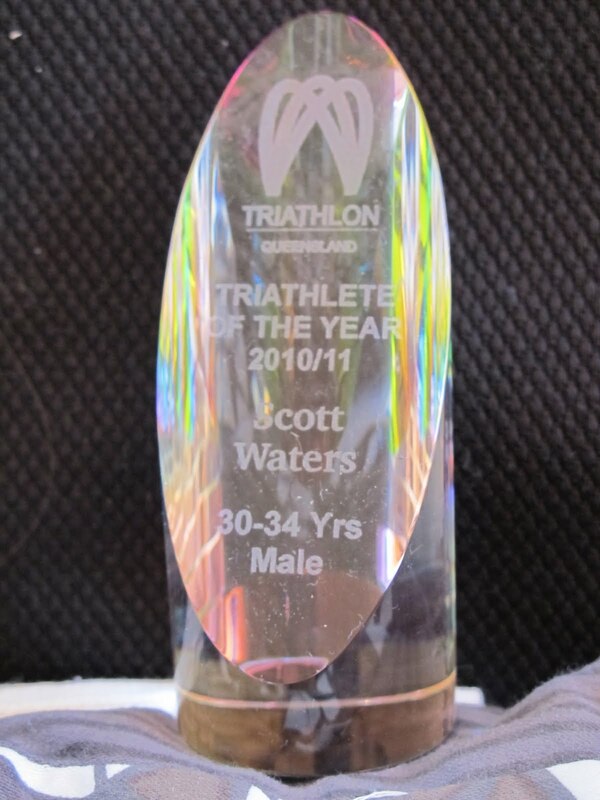 My efforts at the Long Course championships in Yeppoon last August, and my race at the Olympic Distance championships at Redcliffe last month got me over the line! A nice recognition for my efforts, unexpected but welcome all the same. It goes well sitting next to the pottery mugs from the Bribie races. Another bit of great news is that I made the Australian team to compete in my age group in Beijing in September! What makes it even more exciting is that a) a couple of good friends are also heading over to race so we can run amok, and b) my wife is coming over as well so after the race we can take a week off and cruise around Europe or India or somewhere that is a REAL holiday (it's been a while since I had one of those!). I am incredibly happy to be representing Australia. Growing up I always thought it would be playing soccer, which was a genuine goal from a young age. A few injuries later and the *ahem* social side of Uni saw an end to that. So normally this would be the part of the year when I kick back and enjoy 'unstructured' training - getting out on the bike when I feel like it, running when it takes my fancy and swimming... well, watching swimming on You Tube and thinking about getting in the water. But I've had to adapt a bit this year. After the Ironman in December gave me such a high I entered Cairns while delirious with endorphins. Plus it was early in the season and warm. So now, 5 more months of training and racing in my legs and the weather (and sunlight for that matter) dropping I'm wishing maybe I gave it a miss. The friendly organizers at USM Events have allowed me to drop back from the Full to Half Ironman which takes the pressure off. So in 3 weeks I will toe the line, ready to knock out 1.9k of swimming, 90k of riding and 21.1k of running. Given I am trying to recharge the body and mind now, I am sticking 'loosely' to my training plan without beating myself up over missed sessions. It'll still be an all-out effort, especially since it will be a qualifying race for me to join the Australian Long Course team that is competing in Spain next July. No rest for the wicked right? I am a walking contradiction - on one hand I am saying I will rest (I have even pulled out of Busso in Dec so I can focus on Beijing and take some pressure off) and on the other hand I am saying "let's go to Spain and race some more!". But really, who wouldn't want to go to Spain?